I hope this letter finds you well. I wanted to personally reach out to you on behalf of our current Executive Committee to convey some important updates. 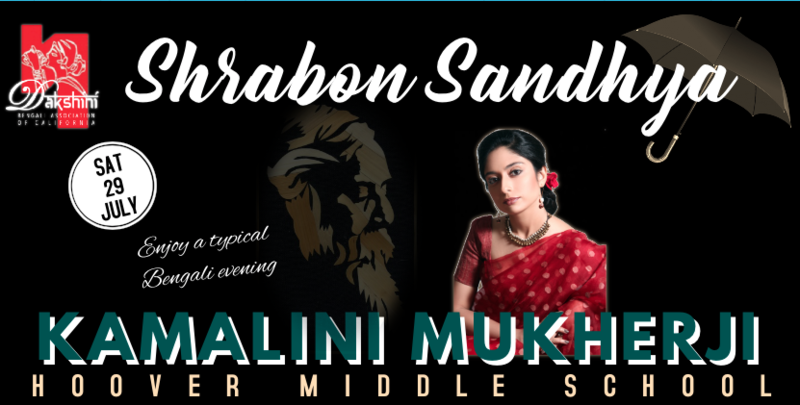 Please join us for Shrabon Sandhya on Saturday - I would like to invite you to our Shrabon Sandhya event on Saturday evening, 29th July, 2017, featuring Kamalini Mukherji, a very popular face among today’s Rabindra Sangeet singers. Affordable pricing for Pujo and Kumar Sanu show - This is a very significant year in terms of Durga Puja and Cultural Program. We are organizing our Puja at one of the most sought after venue along with a world class auditorium in Redondo Beach. Given that, as our Durga Puja is so central and quintessential to our community activities, we have tried to make it accessible to all our patrons. As such, despite extremely high cost of putting up such a tremendous show, our goal is to be inclusive by making the membership and event pricing within the reach of all. AACE Kids Drama - This year we have more participants than ever. Lots of new kids have joined this time! We need your help in making this effort a major success. Kid's Drama Director Siddhartha DattaGupta and coordinating volunteers are working extremely hard to make this a roaring success. New ways to serve our community - Scholarship Award is being sponsored by Dr. Purnima Thakran and dedicated to her parents, Late Commander Sabyasachi and Mrs Latika Chatterjee. Dakshini’s core values are well established and its priority in quality cultural, social, and charitable programs are well recognized. Our current EC are a committed group of individuals from a variety of background in science, technology, business & entrepreneurship, community and non-profit work. Our new committee’s mission is to maintain promoting Dakshini’s core values and try to add exciting ideas into the mix to make Dakshini a more meaningful and global organization. In the process, the new EC will attempt to make a lasting contribution to improve quality of our community lives. With the blessings of one of community members and a lifelong advocate for community service, a Scholarship Program dedicated to Dr. Purnima Thakran’s parents Late Commander Sabyasachi and Mrs Latika Chatterjee is being planned. We sent out an announcement for the award earlier about application and we are extending the deadline (to be decided by end of summer to understand the direction our community wants to take on this) as we recognized more time and discussion is needed for the success of this program. During upcoming Shrabon Sandhya event, we would have a short presentation on our plan related to this award and we would like to hear your thoughts. We will send out a survey as well after the presentation and would like your feedback on this initiative.